Have you ever wished that there was a simple “formula” or methodology for sustainable business success? Order your copy of the 134 page Book TODAY! Price: $9.95 and Shipping in the United States is only an additional $4.50. During a business career spanning over 40 years, Dr. Lee Thomas has often been asked what his keys to success are. 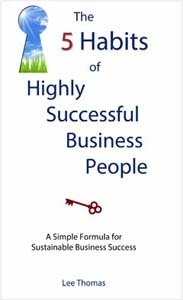 After a great deal of reflection into his apst achievements and missteps, and the achievements and missteps of other successful business people, Dr. Thomas has written on the habits practiced by successful business people. He believes unequivocally, that if a business person learns, practices, and shares these five habits they will achieve sustainable success. The two most important days of your life are the day when you are born, and the day when you find out why.